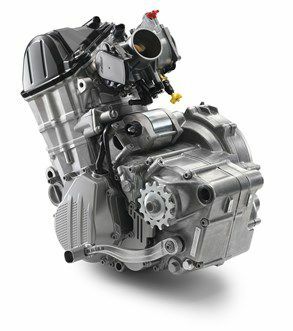 The 450 SX-F is fitted with a newly developed SOHC (single overhead camshaft) cylinder head which is much more compact, 15 mm lower and 500 gr lighter. The changes have further improved mass centralization, elevating handling to new levels of excellence. The new overhead camshaft is also closer to the center of gravity and features an improved surface and shorter valve timing for improved responsiveness. The four ultra-lightweight titanium valves (intake 40 mm, exhaust 33 mm) are activated via extremely rigid rocker arms. The rockers on intake side are DLC coated, allowing for impressive engine speeds up to 11,500 rpm. New low-friction chain guides have also been added to further support the increased engine levels. The new head configuration guarantees the most efficient delivery of the unrivalled power, keeping a strong edge over the competition. The KTM 450 SX-F's crankshaft is located in an ideal position close to the center of gravity, contributing to better mass centralization. It utilizes a short connecting rod, which allows for a compact motor design and a snappier power delivery. The whole unit is extremely well-balanced, with the perfect amount of inertia for optimal traction and ride-ability. A plain big end bearing with two force-fitted bearing shells, runs directly on the crank pin, with the necessary oil feed for this bearing supplied by the engine's pressure lubrication. This design also enhances durability, allowing for long crankshaft service intervals - resulting in less effort and cost and more time spent on two wheels. 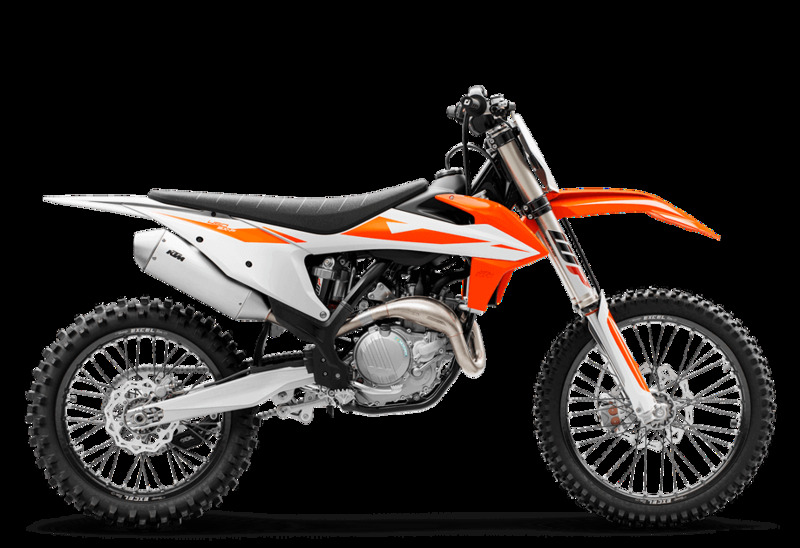 The 2019 KTM 450 SX-F uses a reworked transmission that further improves durability. There was no need to change the gear ratios as they have been perfectly matched to the power delivery of the large displacement engine. All four-stroke engines are fitted with a gear sensor, which provides the option of different engine characteristics for each gear, depending on engine load. An advanced "NO DIRT" gear lever design prevents dirt from building up and together with the new reliable gearbox, guarantees the next gear is always an easy click away. The compact engine cases are manufactured using a high pressure die-cast production process that helps with weight reduction, while retaining strength and durability. The design allows for optimal shaft arrangements close to the center of gravity, resulting in better mass centralization and easier ride-ability. Plus, the new engine covers feature a smart surface structure that reduces wear caused by the rider's boots, keeping them looking as fresh as the day you bought it. The 95 mm bore cylinder houses a lightweight, box-in-box type piston, made to the very highest standards. Its design contributes to the engine's low vibrations and overall engine speed strength. The compression ratio is at 12.75:1 and due to the low oscillating masses, the engine is not only powerful, but also displays extremely lively characteristics. 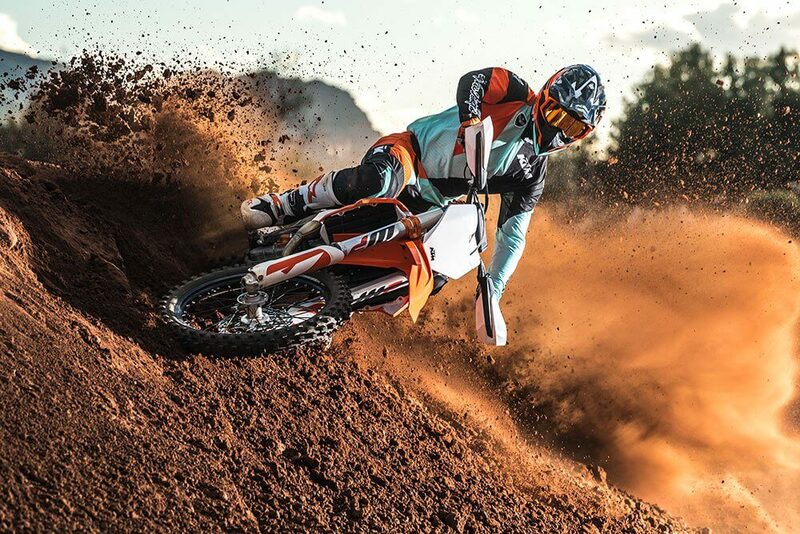 The KTM 450 SX-F is fitted with the extremely durable, KTM-developed DDS clutch (damped diaphragm steel), with a wear-free steel basket and heat resistant clutch plates. It uses a diaphragm spring instead of the usual coil springs, which results in considerably easier clutch action. The diaphragm spring is also compact enough to allow for a damping system to be integrated into the clutch hub, contributing to better traction and durability. Additionally, the Brembo hydraulic system provides easy and precise clutch modulation. The KTM 450 SX-F features a new one-piece swingarm, manufactured using a gravity diecast production process. 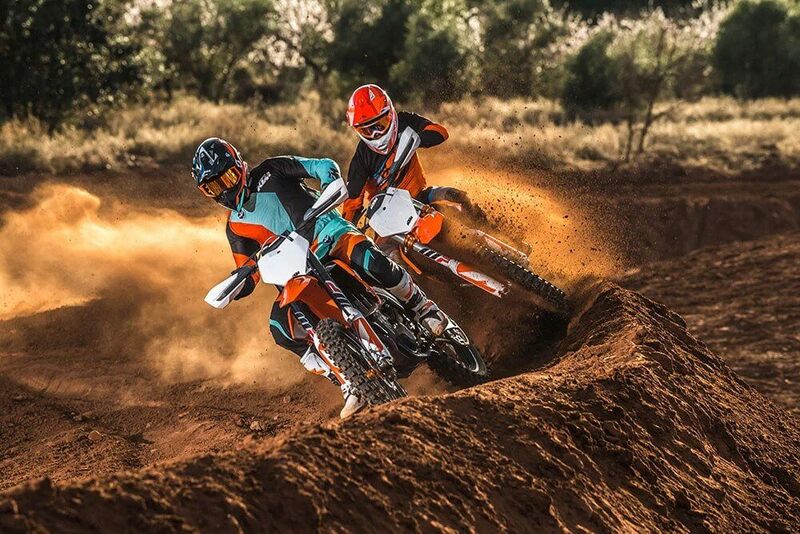 With the exceptional strength required to withstand the tough conditions of motocross and the brutal torque of a 450cc, it has a 5 mm longer axle slot, giving riders more options when aiming for the ideal wheelbase setup for all conditions. This is all achieved at the lowest possible weight. The chain measurement markings on the swingarm are visible from above, for simpler and more accurate adjustment. The frame on the KTM 450 SX-F is newly designed to better endure the extreme forces this powerhouse will put it through. For this reason, along with the rest of the 2019 SX range, its professionally crafted hydro formed Chromium Molybdenum steel tubes are robot welded, for the highest levels of consistent quality and strength. The increased frame stiffness improves handling response, while it is designed to work in harmony with the suspension, for improved comfort and better high-speed stability. The new frame features "no-dirt" footpegs that have a simple but effective self-cleaning system. This ensures the footpegs return to their original position, providing complete control in all conditions. 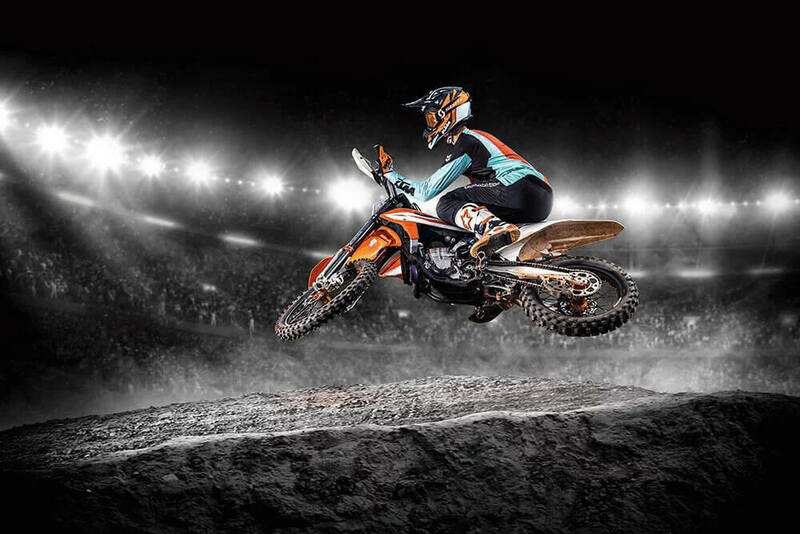 All 2019 SX-F 4-stroke frames feature three new brackets for easy installation of an optional composite skid plate offered through the KTM PowerParts program. 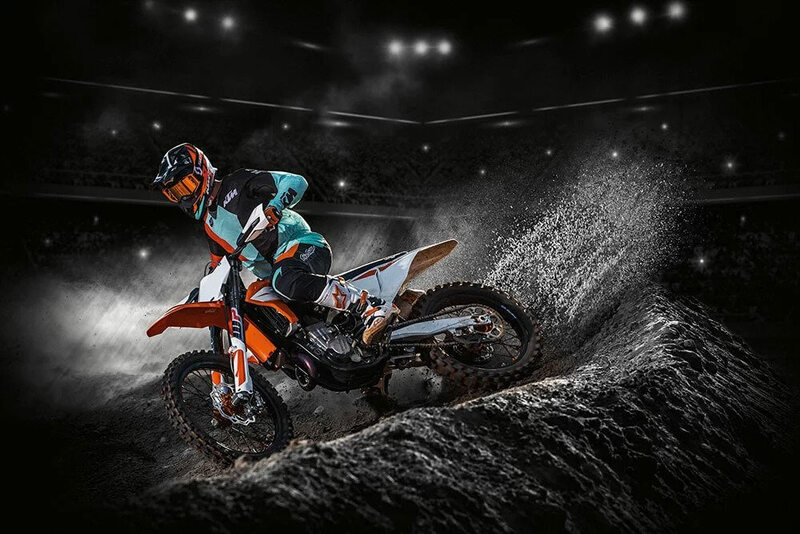 For 2019, all SX frames feature a highly durable powder coating, just like the KTM Factory machines, and come with standard frame protectors. The lightweight aluminum subframe is 40 mm longer, providing more rear fender stability and easier movement across the seat. The new airbox on the KTM 450 SX-F has been completely reworked to ensure better flow dynamics, and together with new intake snorkels, leads to optimal power and throttle response. Despite the obvious performance enhancements, the new design also offers maximum protection against soiling of the air filter. The large Twin-Air air filter is mounted on a cleverly designed stiff cage that minimizes incorrect installation. As found on previous models, filter maintenance is quick and easy and does not require tools - a standard, original feature from KTM. All full-size SX models are equipped with the same high-strength aluminum tapered handlebar, made by NEKEN. The handlebar is fixed in rubber damped mountings, which allow for two different positions. The handlebars come standard with an ODI vulcanized grip on the right side and a comfortable ODI lock-on grip, which does not require any wire or glue, on the left. They also feature a reworked bar-pad with a newly designed cover that can be attached and removed a lot quicker and easier. This bike's carefully chosen handlebars and grips are exactly what is needed to hang on to, and control this powerful beast.